In this new GL-12 exercise video, I reveal how to lift your way lean and strong in a quick but powerful workout progression for your abs. We progressed through my Rep-Range Lactic Acid (RRLA) Workouts in earlier videos to prime your body for muscular development and the release of growth hormones to really get your body into a fat-burning environment, and so we’re going to continue into phase two of our Metabolic Resistance Training, or MRT, exercises. Now that we’re primed for fat loss, we want to really focus more on core and ab development in this set of “Ab Finisher” MRT exercises, and getting our abs to pop with that toned, flatter, more defined look. Don’t expect to be doing non-stop crunches or situps in these Ab Finisher triple set MRT workouts. These Ab Finishers are going to kick up your heart rate while targeting all areas of your abs and core. New research has revealed doing abs in this fashion and ignoring the old-school crunches is not only going to save your back, it’s going to help you burn more fat because these exercises elevate your heart rate more and they continually activate more of your core. Now when you look at your log sheet, you’ll notice we’re going to do these MRT exercises for 30 seconds at a time. So rather than focusing on reps, like we were in the RRLA cycle, or the first phase, we’re going to be focusing on doing these workouts for time. These MRT exercises are set up in a triple-set fashion. That means it’s three ab and core exercises done back to back (to back). And they’re done for 30 seconds at a time with 30 seconds rest in between. So check out the Get Lean in 12 team in action in the video above as I walk you through your very first triple set of MRT Ab Finisher exercises, including exercises that focus on developing your core while targeting your upper abs, lower abs, obliques, and the hidden ab muscle, the transverse abdominis. 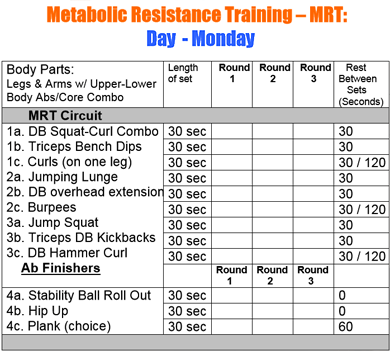 Remember, with these Metabolic Resistance Training workouts you’re going to get a 38- to 48-hour afterburn, so your metabolism will still be burning calories and fat at an elevated rate for up to two days after you complete these short but intense workouts! How will this work when me and my husband have over 60 pounds to loose my hubby is over three hundred pounds and I am over 198 will this work for us? I want to know more about your program and I do not use facebook. If you follow the suggested protocol, you will be burning calories at a faster rate for 38 to 48 hours after your workout so it should work. You can also reach out to us at support@getleanin12.com if you have any other questions for us.